Complete this exciting 48-piece floor puzzle to catch the most exciting moment of the game: a goal! 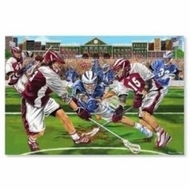 At two feet by three feet this Lacrosse-themed jigsaw scores big points for visual impact. It's the perfect quiet-time activity for kids who love action. "Easy-Clean" surface keeps puzzle looking new.